The ProSet PB3400 battery powered rivet tool – cordless design is designed for portability, durability, and easy maintenance. Sets up to 1000 structural blind rivets in 3/16″ and 1/4″ diameter per battery charge. Easy to Use with the Quick Release nose housing & jaw guide. is a cordless tool designed for portability, durability, and easy maintenance. It offers many innovative high-performance features including a patented Quick Release nose housing and jaw case for rapid cleaning and maintenance of the front end without the need for any tools. Capable of setting structural blind rivets from 3/16″ to 1/4″ size. The Quick Disconnect feature is also found on the 3400 Mandrel Collection System (MCS), which allows mandrels to be safely collected for easy disposal and cleaner work areas. An air-isolation switch on the MCS prevents airflow when the MCS is disconnected. 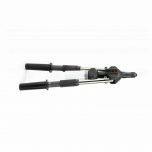 The tough aluminum casing is designed to prevent damage and enhance the life of the tool. Extended 5″ (140mm) long front end for extra reach. If you have questions about the Proset PB3400, then request a consultation or call the POP tool experts at (866) 748-3876 for assistance! If your POP Proset PB3400 isn’t functioning properly, then check out our rivet gun parts and repair services. Sets Blind Rivets from 3/16" thru 1/4"
1 – Bag with nosepiece and jaw pusher 3/16"
1 – Bag with nosepiece and jaw pusher 1/4"
Tool delivered in sets with 20V Max 2.0Ah or 4.0Ah DeWALT XR Li-ion batteries including fast charger. All batteries with charge indicator.